This document is about a textile I wove for the Fall 2001 sample exchange of the Medieval Textiles Study Group, a special interest group of Complex Weavers. I developed this weaving draft from a drawdown published by Daniël de Jonghe (De Jonghe 1989, p. 241). The original textile is a relic, the "Sluier van Maria" (Mary's Veil) at the Basilica of Our Lady in Tongeren, Belgium. It is believed to be eleventh or twelfth century in origin (De Jonghe 1988, pp. 65-66). The neatest thing about this textile, from my point of view, was its alternating lines of warp and weft floats—a sort of combined barleycorn and huck weave. 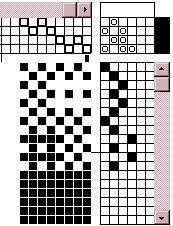 The weaving draft was prepared using WinWeave version 1.0. Here is a scan of a sample of the completed textile. I wove it at 36 epi from 20/2 Czechoslovakian [sic] linen as my contribution to the annual sample exchange of the Medieval Textiles Study Group, a special interest group of Complex Weavers. De Jonghe, Daniël. 1988. "Technologische Beschouwingen," pp. 65-88 in Textiel van de vroege middeleeuwen tot het Concilie van Trente . Tongeren Basiliek O.-L.-Vrouw Geboorte, vol. I. Leuven: Uitgeverij Peeters. Chapter on the weaving techniques found on relic textiles from the Basilica of Our Lady in Tongeren, Belgium. -----. 1989. "Niet op trapweefstoelen geweven linnen weefsels met ruitpatronen?," pp. 222-241 in Middeleeuws Textiel, in het Bijzonder in het Euregiogebied Maas-Rijn [Medieval Textiles, Particularly in the Meuse-Rhine Area], Proceedings of the [First] Congress, Alden Biesen, 13.02-16.02.1989. Sint-Truiden, Belgium: Provinciaal Museum voor Religieuze Kunst. Considers a group of medieval linens and silks for clues to the types of looms that could have woven them. Several drawdowns. Priest-Dorman, Carolyn. 2001. "Some Medieval Linen Weaves." Complex Weavers' Medieval Textiles , Issue 30 (December 2001), pp. 1, 4-5. 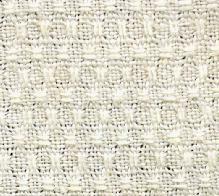 Presents weaving drafts and sources for several simple textured linen weaves from the Middle Ages, including the Sluier van Maria huck weave. This page was created on 26 November 2001 and last updated on 29 November 2001.